32.5 mm. width, 49 mm. length. ; overall length approx. 195 mm. With Omega fitted presentation box. 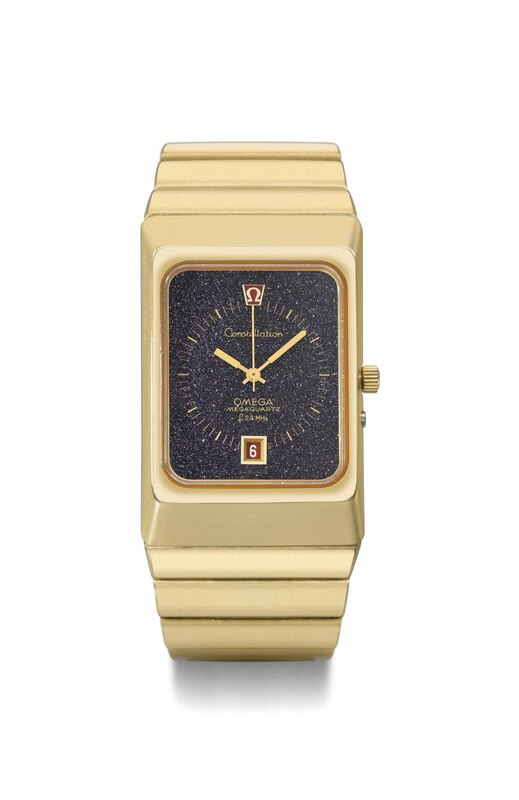 According to the archives of Omega, the present watch was manufactured in 1975. The present watch is from the 1972 series, fitted with a calibre 1510 movement, and particularly rare as "all gold" version with the attractive blue aventurine or "stardust" dial. The first prototype of the Megaquartz 2400 was presented at the Basle Fair in 1970. It was fitted with the calibre 1500 movement developed by Omega and the Battelle Institute of Geneva after fifteen years of research. With its precision of one second a month, around 10 times superior to any other quartz watch, it is considered one of the most accurate wristwatches in the world. The accuracy results from a specially designed resonator, sealed in a capsule and vibrating at an extraordinary rate of 2,359,296 times a second, awarding the model with the title of "Marine Chronometer". Based on calibre 1500, three very similar evolutions were developed in parallel, and destined to three different Omega models: calibres 1511 and - slightly later - 1516 would power two Marine Chronometer watches, calibre 1510 is instead found in the Constellation Megaquartz. The model is illustrated and described in Omega - A Journey through Time by Marco Richon, p. 375, stating that ref. BA396.0806 was fitted with a gold bracelet with domed links. Aventurine is an ornamental stone constituted of quartz (blue, grey, green, orange, yellow or gold-brown) with inclusions of mica or hematite, giving the shimmering or glistening effect also called "stardust".